7 Wonders is back with an all-new rotatable board! 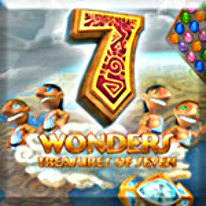 7 Wonders: Treasures of Seven is the latest installment in the 7 Wonders series. It's time to build nine of the most intriguing structures throughout history! Match runes to break blocks and uncover the lock and keystone for each round. Rotate the cube face to move your keystone along the pathways you've created to reach each level's lock and conquer all six sides! Once you've mastered the faces of the outer cube, move to the inner cube where you’ll attain pieces to build your compass. Build all nine amazing wonders, and you'll uncover the hidden city with the help of your map and compass. Don’t miss this incredible and innovative chapter in 7 Wonders: Treasures of Seven!